We hope to develop a way that allows us to know precisely when our laundry is finished and receive a notification when that should happen. Instead of setting a timer or using an app, this product will easily send a simple notification to our smartphone telling us our laundry is finished. To accomplish this task, we plan to implant an accelerometer onto a washing or drying machine and detect the vibrations from the respective machine. Here, we naturally assume that all laundry machines experience such vibrations during their washing/drying cycles. When these vibrations stop completely, the accelerometer will catch this long-term cessation of motion and duly send a message via Ethernet and/or Bluetooth to our smartphone notifying us that our laundry has finished washing or drying. During this process, the accelerometer must necessarily experience changes in motion due to the laundry machine vibrations, so to accommodate such movement, we plan to create a mechanistic boundary over which the accelerometer can move. Most importantly, the accelerometer will begin detecting changes in motion automatically, thereby making the use of an alarm or stopwatch completely unnecessary. Moreover, we believe that our method of retrieving laundry immediately after it has finished is much more efficient than using a stopwatch or fumbling with a smartphone app. Many things can go wrong when you're trying to do laundry in college. You can forget your laundry in the dryer, the dryer might not be working, or someone might move your laundry so they can get a machine. Worst of all, you can become a victim of laundry theft. We hope to solve these problems with the LaundroMeter. In order to solve these problems, we attached an accelerometer to the door of the laundry machine in order to determine when the door was opened based on the acceleration of the door as well as to tell whether the machine was on, based on the vibrations of the machine. We also added a temperature sensor to the inside of the dryer so we could figure out if the laundry was actually being heated or not. We then enabled Bluetooth communication between the Arduino with the sensors and an Arduino connected to an Ethernet port to allow the Arduino connected to Ethernet to send messages to the user's phone. 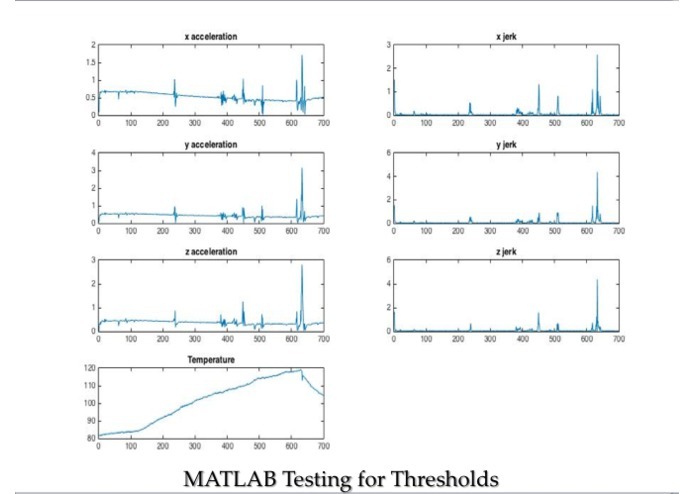 After much data analysis through MATLAB, we were able to find the thresholds to determine when the door was opened, when the machine was on or off, and when the temperature of the machine was going up. To figure out when the dryer had started, we used the temperature sensor and sent a notification to the user. That is, if the user did not receive the message that the dryer had begun a load of laundry, they would immediately realize that the dryer was defective and would be able to switch dryers. In order to ascertain when the door of the laundry machine had opened, we experimentally determined thresholds by opening the laundry machine door multiple times. We found that we got the most consistent results when we measured jerk, the derivative of acceleration, because there was a great deal of distortion and noise in the acceleration graphs. Then, we added code such that whenever jerk exceeded a certain threshold value, the user would be notified that the door had been opened. Finally, to determine when the laundry was finished and tell the user that it has finished, we used a threshold for acceleration. Because laundry machines tend to vibrate when they are on, we were able to measure the magnitude of these vibrations with acceleration values from the accelerometer. When the acceleration values were below the thresholds we found experimentally, we sent a message to the user to let them know that their laundry was done. Additionally, because the vibrations of the laundry machine weren't always consistent or could be modified by the vibrations of other laundry machines nearby, we set an internal timer in the LaundroMeter that would send a notification to the user after a certain period of time after the laundry had started. These two methods ensured that the LaundroMeter would notify the user when the laundry had finished. To message the user, we used a combination of Bluetooth and Ethernet communication. The Arduino on the laundry machine would communicate with an Arduino connected to Ethernet that would send a certain message to thingspeak.com, which, in turn, would send an SMS to the user. Each function of the LaundroMeter corresponded to a different text message that would be sent to the user, letting the user quickly know the status of their laundry. 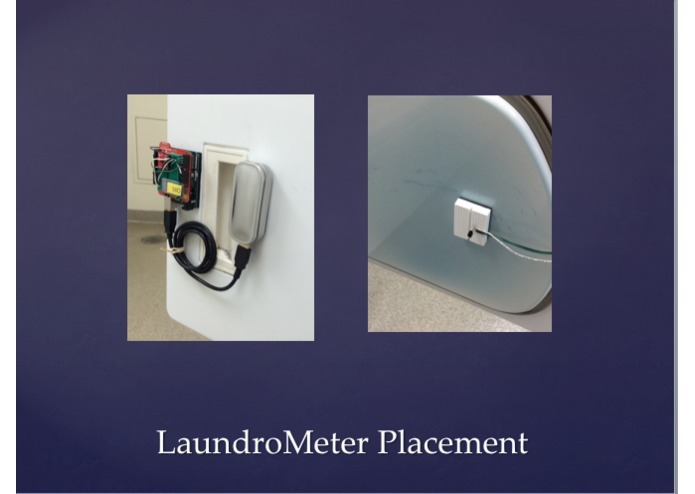 In the end, after conducting a large amount of research as well as gathering and analyzing data, we created a LaundroMeter that was able to solve many of problems that students doing laundry tend to face. //Threshold values used to determine events for the dryer. //Since jerk is calculated with calibrated accelerations, it does not need to have its own calibration. boolean dryerstarted = false; //boolean representing whether the dryer has started. Initial condition assumes the dryer is off. boolean dooropen = false; //boolean representing whether the dryer door is open.Initiial condition assumes door is closed. //Begin communication with bluetooth and serial monitor. //Uses these consecutive values to calculate jerk. //Door Opened: Occurs when the accelerations reach a certain value and the door is not already open. //and the dryer has already been started. Could also occur if the drier has been running for long enough. I worked on most of the hardware of the LaundroMeter and Ethernet Arduinos and also assisted with the creation of the videos. I worked on the video and a large portion of the software. We've added our final video, technical description, and some code to our page.